LEGION is Now Accepting Pre-Orders! Limited-Time Exclusive Discounts! 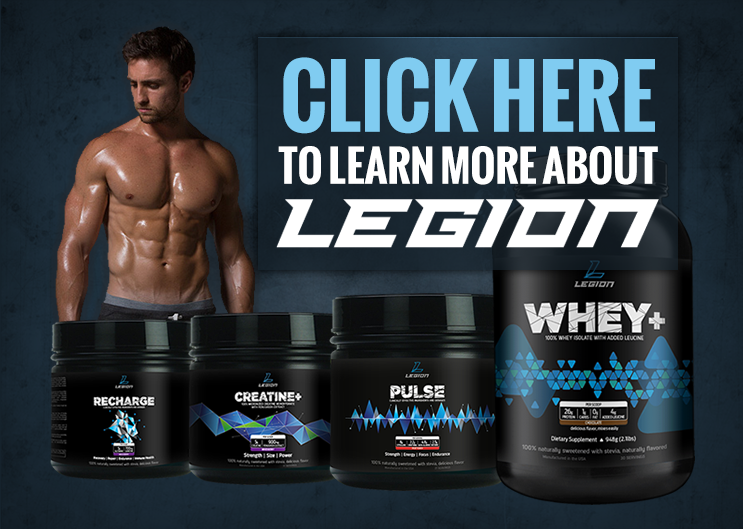 After working on it for nearly 8 months now, I’m proud to announce the launch of LEGION, my line of supplements! Pre-orders have begun, and I’m offering some pretty awesome discounts to kick things off. The supplement industry could be best described by Obi-Wan Kenobi’s famous words: a wretched hive of scum and villainy. While certain supplements can help, they do NOT build great physiques (proper training and nutrition does), and most are a complete waste of money. So if that’s the case, then you might be surprised to hear that I’m launching my own line of supplements, LEGION. What gives? Am I just a hypocritical sell-out? Should you grab your pitchfork and run me off the Internet? Well, hear me out for a minute and then decide. 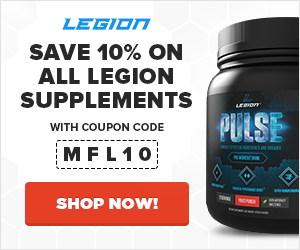 The first thing you should know is that I created LEGION with the purpose of not only bringing unique products to the supplement world, but of starting a movement. Here’s what I know: with the already overwhelming amount of options out there, the last thing we need is yet another marketing machine churning out yet another line of hyped up, flashy products claiming to be more effective than steroids. Well, I think things should be done differently, and I’m going to do something about it. I believe in being the change I want to see, and that’s what LEGION is truly about. There’s absolutely no reason to use them for anything other than deception and fraud. I have a simple standard: every ingredient used in a workout supplement should be backed by peer-reviewed, published science that demonstrates clear performance benefits. Furthermore, I think ingredients should only be used if they can be provided at clinically effective dosages. That is, the exact dosages shown to be safe and effective in scientific research. Like artificial sweeteners, consumption of artificial food dyes might not be as harmful as some claim, but there is evidence that these chemicals can cause various negative effects in the body. No exaggerated, deceptive advertising or endorsements. Call me melodramatic, but I feel like we’re getting slapped in the face every time we flip through a bodybuilding magazine. Ad after ad feature hulking freaks hawking one pill or powder or the other as if it has anything to do with why they’re so big and lean. How dumb do these marketers think we are? No over-charging and under-delivering. How annoying is it to buy a $50 bottle of product only to discover that it only lasts 10 days if you follow the usage directions? I think you will agree that these things need to happen sooner than later, and this is exactly what LEGION will offer. LEGION will usher in a revolutionary line of workout supplements that outclasses everything else on the market. These products will be a standard by which all others can be judged. I’m not just looking to build a company. I’m looking to build a culture. I believe in respecting customers, telling things like it is, and delivering what I promise. I believe that honesty and integrity sell better than cutting corners and relying on ridiculous advertisements and lies. I don’t just want to sell you pills and powders, I want to change the supplement industry for the better. Will you join me? Will you become a legionnaire and help me fight the fight? Muscle for Life Success: Daniel N.
Muscle for Life Success: Caleb H.